Harry Potter and The Half Blood Prince is, as I’m sure most of you are aware, the latest entry in the massively popular series concerning the teenage wizard Mr. Potter. For those muggles out there unfamiliar with the plot “The Half Blood Prince” is where the epic tale of good versus evil really heats up; the nefarious Lord Voldemort is back and with one and one thing only on his mind, the absolute and final annihilation of the only person capable of stopping his rise to power: Harry Potter. Sounds pretty intriguing doesn’t it? Unfortunately the DS version of the game really doesn’t communicate this excitement well, in fact it really only touches on what makes the Harry Potter series so magical, no pun intended. 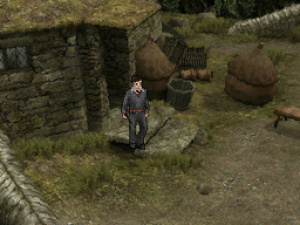 The game begins at a rather uninspired representation of “The Burrow” and the scene is set through a brief cut-scene in which Harry, Ron and Hermione sum up the goings on prior to their return to Hogwarts for their 6th year of school. 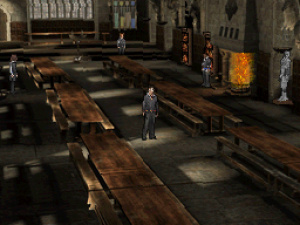 The scene then quickly shifts to the Hogwarts Express and it is here, at such an early stage, that it becomes clear that the game isn’t going to really offer much of an enjoyable experience. Harry is tasked with finding various objects on board the train and trading them with other passengers in order to trigger a cut-scene and therefore progress the story. This may not sound too bad but this is pretty much how the game continues on – the player is given some mundane task (find a book in the library, find some potion ingredients, retrieve’s Ginny’s lost puzzle, etc) only to be rewarded with a cut-scene that moves the story on through speech bubbles and static character sprites. 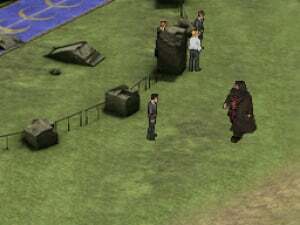 It seems rather odd that the game’s developers decided to include most of the actual story in these rather tedious cut-scenes and instead give the player the task of jaunting around Hogwarts to find completely incidental items. 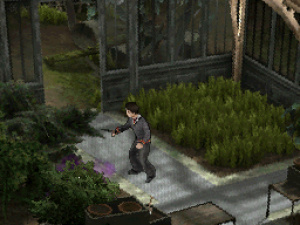 As these tasks become available they are recorded in Harry’s "Remembrall" and the player is free to complete them in effectively any order thus giving the game an (albeit flawed) element of open-ended gameplay. The order in which tasks are completed has absolutely no baring on the story and usually the tasks themselves have nothing to do with the actual story as well. There are a few side-quests - such as completing the Folio-Magi card collection through beating mini-games - but there is little incentive to follow these to their conclusion and indeed after the rather unsatisfying nature of the main quest you may not want to bother. There are also various mini-games on offer in which “Famous Wizard Cards” and other magical paraphernalia can be gained, though these items can also be obtained quite easily by casting spells on bookcases, statues and other objects throughout Hogwarts. The mini-games themselves, although not overly inspiring, aren’t all that bad and Exploding Snap is actually quite good fun. Other games include Skittles and Gobstones (marbles). Other activities available are Wizard Duelling and Quidditch. Duelling is a little bit of a let-down as the touch screen could have been used quite creatively to create an enjoyable and interactive experience. Unfortunately the battles consist of pressing on-screen buttons to decide whether to launch an overhead or low attack and duels can be easily won with simple button bashing. Quidditch is a rather odd experience with segmented gameplay depending on the occasion. For instance, at certain times the player controls the chasers and must pass the ball from player to player through touch-screen controls. At other times the player is the goalkeeper and must ward of incoming quaffles with the stylus under a time-limit. Quidditch isn’t awful but the different segments of play don't quite gel; one can’t help but feel that this section of the game was rushed by the developer. Although it is somewhat unlikely that those who purchase the game will be unfamiliar with the series the game does a pretty terrible job of explaining the storyline and at times it’s actually quite hard to relate an in-game event to the actual event in the book (or film). This makes the game flow quite badly and because the player isn’t actually involved in much of the action you can’t help but feel a bit like a spectator at times. The game’s only redeeming feature is the visuals. While the characters themselves aren’t all that visually impressive Hogwarts itself is a faithful representation of the school as portrayed in the films. It's massive and contains lots to explore and see; credit has to be given to the developers for including the “footprint guide” which leads the player to the appropriate destination to progress the story - without this guide the player would most likely end up lost every few minutes. All of the locations are fairly detailed with multiple students mulling about offering mundane and often quite silly advice. The game’s soundtrack unfortunately matches it’s gameplay - it’s repetitive and really rather boring. There are few memorable tracks and most of the background music is looped. There is no voice-acting in the game and everything is done through speech bubbles. Harry Potter and the Half Blood Prince for Nintendo DS is really a bit of a let down and feels like a step backwards in terms of gameplay as the game itself is little more than one massive scavenger hunt with most of the storyline progressing through bland, boring cut-scenes. A player should never feel like a spectator in a game and unfortunately this is exactly what happens here. Even for fans of the series there is little on offer; it's best to approach this game with caution and perhaps a vial or two of Wiggenweld Potion. The GBC games were fairly decent RPGs, at least when I played them I thought they were anyway! I so almost bought the PS3 version yesterday but didnt. 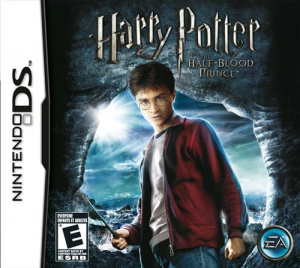 I think this game should be renamed Harry Potter and the Half-Assed Prince. remember the time when most movie based games were good?